Happy Tuesday! Today I want to share a project that I worked on back in 2014, that works out to be quite relevant now. I flew home to Cleveland in early 2014 to film two episodes for It's Sew Easy, which airs on PBS. I adapted two of my older tutorials for the episodes, which is fun. 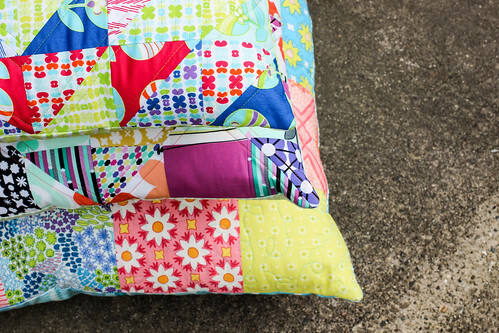 The first episode is 706 and features my Vintage Sheet HST Pillow Tutorial. For the episode, I remade the pillow in Color Me Retro! 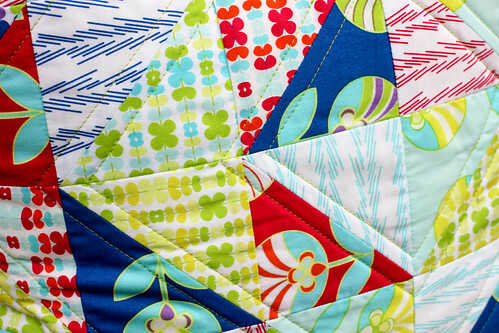 I wanted to share this because this episode is available to watch on Youtube (here), so if you are still unsure about trying half-square triangles, you can watch me make them on video! 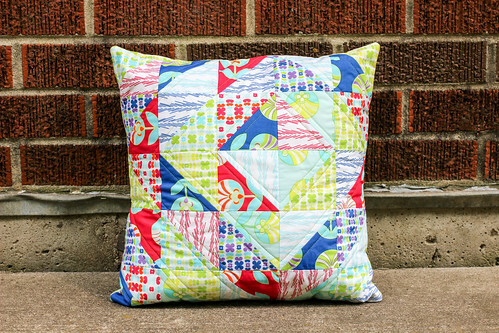 It's a cute little pillow, and doesn't take too long to put together. 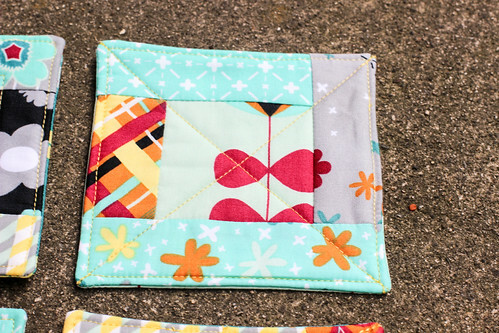 I also brought along a number of other half-square triangle projects for the shoot. My Dreamin' Vintage Half-Square Triangle Sampler quilt, my Warm Cool HST Quilt, my Nordika HST Pillow, and my Quilted Grocery Bag Holder. 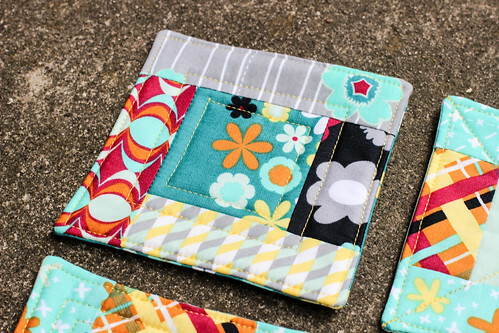 The second episode I taped is 707, featuring my Logcabin Quilted Coasters. For this episode, I remade the coasters in Nordika. These turn out really cute and make a great gift. 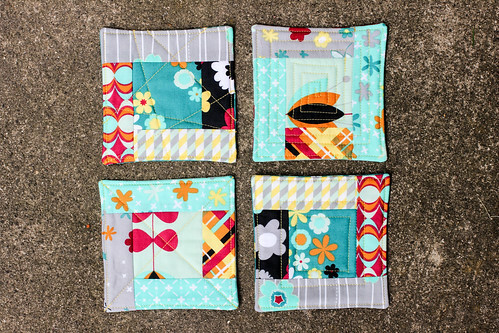 These are a fun way to try out different quilting techniques, I used a different pattern for each coaster. Love making these! 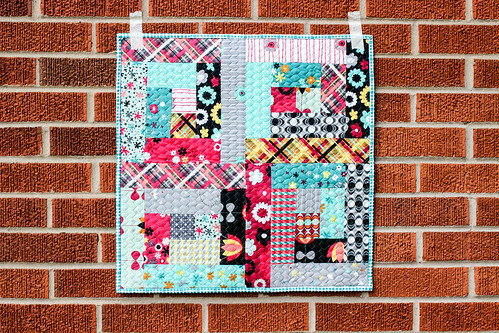 I made another sample for the episode, this log cabin mini quilt, also using Nordika. I cut 2.5" strips to make four small log cabin blocks. 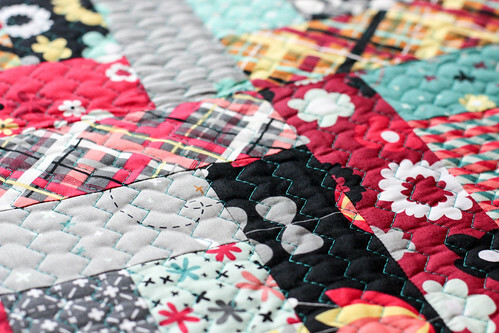 I really need to plan a full size log cabin quilt, these blocks are really satisfying to make. 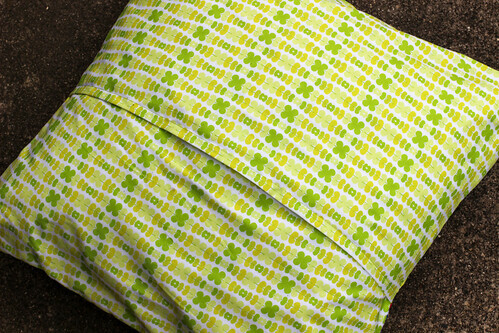 This mini lives under my sewing machine folded in half, to help muffle the noise from my machine. 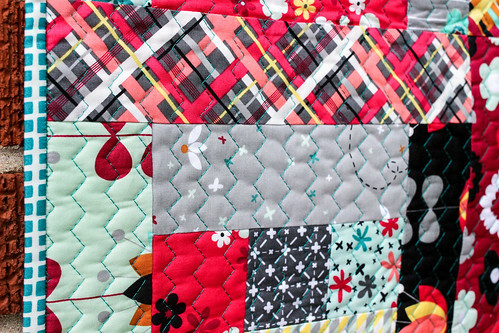 I quilted all of these projects with 50wt Aurifil threads from my thread box. 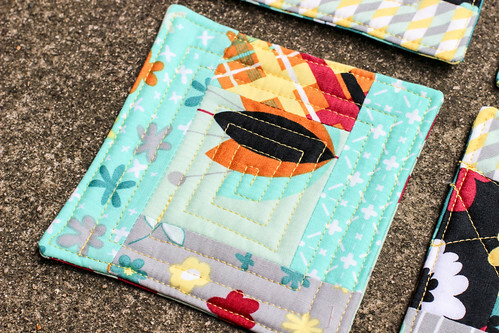 I especially enjoyed using the teal thread in my mini quilt! Part of the reason why I put off sharing this experience and projects is that it wore me out. Even though I was doing smaller projects, the amount of prep work involved in taping these videos was huge. I have at least 7 versions of the pillow (plus enough HSTs to make more) in various stages as step outs for the episode and back-ups in case a part with sewing needs to be shot again. That and I was SO nervous. It was really far outside of my comfort zone to do something like this. I did it, but it showed me that it is not something I enjoy doing. But that's okay! I tried it, and it wasn't a disaster, so all is well. You can check your local listings for these episodes (if you want! ), here. I watched the episode on Youtube. You don't appear nervous to me, you did a good job. 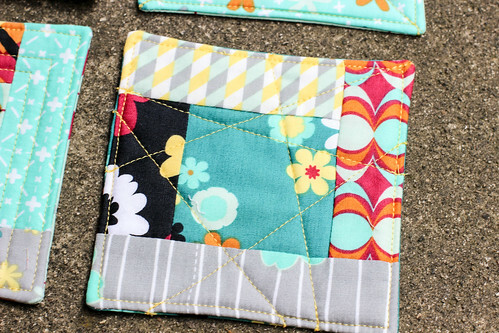 Great tip on how you did the back of the pillow, I never thought of just cutting bigger pieces and folding in half. I usually just hem for the envelope closure. Will your log cabin episode be listed on Youtube in the future? Great job! Most ppl have no idea the time in prep work for all those step outs! Well, these are beautiful pieces, and now you can say you did it. I am the same way though, it is not so much the pressure, but just wanting to be prepared with the best possible supplies for each step. That can be tedious and nerve wracking. As always, your creations are so sweet and lovely. You will enjoy married life. Kudos to you for doing something scary, and well done!